SHIPS GROUND. Please allow 4 to 7 business days for your delivery to arrive. 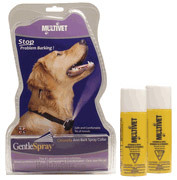 MULTIVET Gentle Spray Value Pack includes Multivet Gentle spray Citronella Anti-Bark Collar, and 2 packs of Citronella Refill (2.4 oz each). Multivet Gentle Spray Citronella Anti-Bark Collar immediately and humanely stop prblem barking, and it is two times more effective than shock collars. Buy this value pack and stop nuisance barking today.